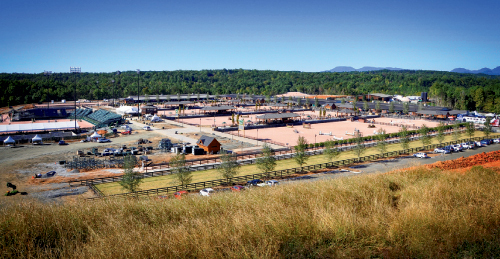 The Tryon International Equestrian Center launched last July with no shortage of fanfare, but this ever-expanding place for all things equine was just getting started. TIEC’s first complete season commences in April, putting its full potential on track. Set on 1,400 acres in the foothills just east of Tryon, the center already boasts five riding arenas, 500 stables, riding and hiking trails, a village of luxury rental cabins, and an RV park. New eateries, including a 1950s-style diner and more gourmet-oriented establishments, are nearing completion, and a hotel is slated for late 2016 with a spa resort and golf course to follow. Mike Bellissimo, CEO of Tryon Equestrian Partners, which owns the venture, says the center’s grand aspirations have found a fine fit here. “We were looking for a place that could be a spring/summer/fall destination, and with the great weather and horse culture that exists in this area, which dates back to the 1930s, we thought this would be the perfect place to go,” he says.